This is a most superb performance, first rate in every way, and very sympathetically rendered; you can believe these performers find this music beautiful, always a help with contemporary music! Well worth the money- very enjoyable listening. Luigi Dallapiccola (1904-1975) played a crucial role in bringing serialism and modernism to Italy. "Il Prigioniero" (The Prisoner) was the main vehicle for this process, a rigorously serialist opera of one act (about 45 minutes long) that nonetheless sounds entirely Italian in its lyricism. Dallapiccola had the idea for the opera in 1939, adapted mainly from the French story "Torture by hope." He wrote the music and the libretto through the war years, and finished it in 1948. Though set in Spain during the Inquisition, the relevance to current events of the time of fascism is obvious, and unfortunately it is still relevant today. The great German conductor Hermann Scherchen led the premiere on December 1, 1949 in Turin, an Italian Radio broadcast. This live recording was made in Stockholm in March 1995. Esa-Pekka Salonen leads the Swedish Radio Symphony Orchestra, and Mats Nilsson and Per Borin lead the Swedish Radio Choir and the Eric Ericson Chamber Choir. The three principal singers are Jorma Hynninen as The Prisoner, Howard Haskin as The Jailer, and Phyllis Bryn-Julson as The Mother. Comparing "Il Prigioniero" and Dallapiccola's other great opera Ulisse to German serialist operas like Zimmerman's "Die Soldaten" and Reimann's "Lear," it is clear that the serialist method can be used to achieve a wide variety of aims and effects. "The Prisoner" is full of tenderness (much of which turns out to be false), and the singers, choir, and orchestra sound lush and beautiful for the most part rather than harsh and grating. As Francesco Lombardi says in the liner notes, "'Il Prigioniero' is a tragedy in which freedom is denied absolutely and finds no consolation in any kind of faith. Instead, this freedom is entrusted to the power and the precision of the musical forms which are to underscore the drama's grandeur and ineluctability." The disc is filled with the "Canti di prigionia" (1938-1941), "Songs of Imprisonment," three choral works with sparse accompaniment that address the same issue and set the tone for the subsequent opera. In fact a passage from the first song is used in the final scene of "Il Prigioniero." Dallapiccola's choral writing is stunning. This is a 20th century classic of opera, and should be heard by all who love modern music and modern opera. Luigi Dallapiccola wrote both the music and libretto for his opera 'Il prigioniero' (The Prisoner), a work with a prologue and one act. The opera was written between 1944 - 1948 and was first broadcast by the Italian radio station RAI on 1 December 1949. The work is based on the short story La torture par l'espérance ("Torture by Hope") from the collection Nouveaux contes cruels by the French writer Auguste Villiers de l'Isle-Adam and from La Légende d'Ulenspiegel et de Lamme Goedzak by Charles de Coster. Dallapiccola's early experiences under the fascist regime of Benito Mussolini colored his outlook and output for the rest of his life. He once supported Mussolini, believing the propaganda, and it was not until the 1930s that he became passionate about his political views, in protest to the Abyssinian campaign and Italy's involvement in the Spanish Civil War. Mussolini's sympathy with Adolf Hitler's views on race, which threatened Dallapiccola's Jewish wife Laura Luzzatto, only hardened his stance. His first protest work, 'Canti de prigioniero' from 1938 is included on this recording for a live performance of both the opera and the three choruses in March of 1995 in Sweden. Esa-Pekka Salonen conducts the Swedish Radio Symphony and Choir and the soloists are Phyllis Bryn-Julson, soprano, Howard Haskin, tenor, Lage Wedin, bass, Sven-Erik Alexandersson, tenor, and Jorma Hynninen, baritone. It is a desperately moving work and one that pleads to be performed more frequently. 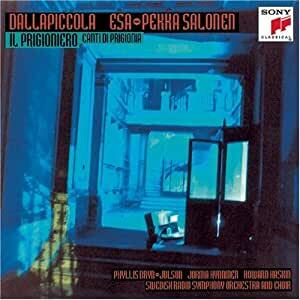 The radiant performance of 'Canti Di Prigionia for chorus, 2 pianos, 2 harps & percussion' is a treasure. For this listener the performance echoes those in the early 1960s when Dallapiccola was composer in residence in Los Angeles and conducted our college ensemble in these three parts: Preghiera Di Maria Stuarda (Mary Stuart's Prayer), Invocazione Di Boezio (The Invocation Of Boethius), and Congedo di Girolamo Savonarola (Girolamo Savonarola's farewell). As many listeners will find, the music at first seems difficult to understand (it is very difficult to sing....), but after a listening or two the music becomes so natural an expression of agony that it can only be considered on of the more important choral works of the last century. This opera should change the minds of the most truculent enemies of 20th century music (even 12-tone)because, as the other reviewer has said, its dramatic power and the sheer beauty of the music will capture and hold almost any listener. Dramatically it has much to say to us in the 21st century; although it is set during the sixteenth century Spanish inquisition, the issues of the abuse of power and the ambiguities of guilt and innocence in the midst of political conflict are derived from 19th century sources and resonate in today's political climate. More importantly, the marriage of music and drama in this brief work is unusually effective for a modern opera. This performance is well-recorded and the orchestral and choral forces perform excellently, as does Jorma Hyninnen in the title role; what keeps this recording from being unquestionably superior to the Mondo Musica set, which includes also Dallapiccola's _Job_, is the less effective singing of Phyllis Bryn-Julson. Bryn-Julson is an effective singing actress, but her voice is edgy and unpleasant at times and seems not as right for the role as that of Magda Laszlo on the other recording. Because this set is a single CD and less expensive, it is likely to be the usual choice and there is no harm in that--it is a fine introduction to a great work, but if possible, try to hear the Gracis recording as well.